I’m a Classic Sewing magazine subscriber, how do I download files? I purchased a single issue copy of Classic Sewing magazine online from the Classic Sewing website, how do I download files? I purchased a single issue copy of Classic Sewing at a shop or newsstand, how do I access the download files? I purchased a single issue copy of Classic Sewing at a shop or newsstand, how do I download files if I have already created an account on Classic Sewing’s website? I purchased a single issue copy of Classic Sewing. Where do I find the code for the FREE downloads. I am having a problem with logging in or with my password. Where may I purchase back issues? I have subscribed or renewed my subscription to Classic Sewing. Where do I access the Helen Catherine monogram? I still have not received my current issue. I purchased a Video Sewing Room class or Monogram Set, how do I access after I have purchased? I’m still having issues with my online account. I have already purchased a video online. How do I get the discounted Classic Sewing USB drive to watch videos offline? Q. I’m a Classic Sewing magazine subscriber, how do I download files? A. To access the downloadable files, sign in by going to My Account. Your available downloads will be listed in your Dashboard. If you have not received an email about your account, please Contact Us. Q. I purchased a single issue copy of Classic Sewing magazine online from the Classic Sewing website, how do I download files? A. The downloads are available instantly after you checkout. Go to My Account and the downloads will be listed in your Dashboard. If you did not create an Account during Checkout please Contact Us. Q. I purchased a single issue copy of Classic Sewing at a shop or newsstand, how do I access the download files? A. To access the downloadable files, go to My Account. You must first Register by setting up an Email address and Password under Single Issue Download Registration. Once you’ve setup your Account, proceed with the steps below. Q. I purchased a single issue copy of Classic Sewing at a shop or newsstand, how do I download files if I have already created an account on Classic Sewing’s website? Q. I purchased a single copy of Classic Sewing magazine. Where do I find the code for the FREE downloads. A. The download code is located on the Editor’s Note page. Q. I am having a problem with logging in or with my password. A. Please go to Reset/Forgot your password? to reset your password. An email will be sent to you with a link to enter a new password. If you’re still experiencing problems, please Contact Us. Q. Where may I purchase back issues? A. Back issues are available in the Classic Sewing Magazine Store. 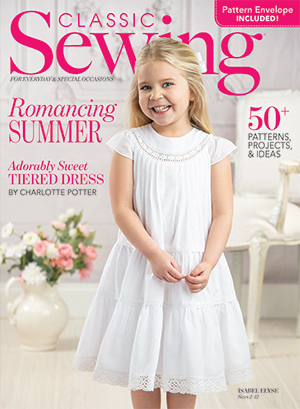 Q. I have subscribed or renewed my subscription to Classic Sewing. Where do I access the Helen Catherine monogram? A. The Helen Catherine monogram is available under the Downloads page but you must be logged into your account to access. You can also log into My Account. Select “Subscription” under the My Membership dashboard. The monogram downloads are an exclusive part of your magazine Subscription. Q. I purchased a Video Sewing Room class or Monogram Set, how do I access after I have purchased? A. The videos and downloads are available instantly after you checkout. Go to My Account and your products will be listed in your Dashboard. If you did not create an Account during Checkout please Contact Us. Q. I still have not received my current issue. Q. I’m still having issues with my online account. Q. I have already purchased a video online. How do I get the discounted Classic Sewing USB drive to watch videos offline? A. Subscribers receive a 20% discount just by logging into your account during checkout. If you’ve already purchased one of Gail’s video classes please go to the video on our Classic Sewing store. Select the USB format. Add to cart. Enter the coupon code you were emailed to deduct price of the full video. Limit to 1 USB drive per video purchased.